Throughout his career, professor Zhili Xiao has been a force in physics, pioneering uncharted territory in the research fields of superconductivity and nanoscience. And, since he arrived at NIU in 2004, the force has been with more than a few bright NIU physics students, who have come along for the ride and are now forging their own paths. 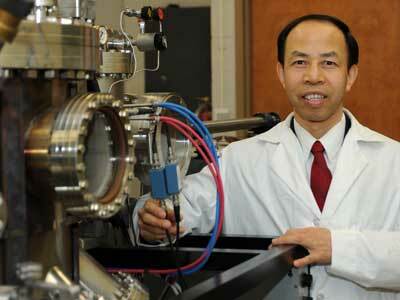 Xiao holds a joint appointment with NIU and Argonne National Laboratory. In 2005, R&D Magazine named an ultra-fast hydrogen sensor developed by Xiao’s research team at Argonne as one of the world’s top 100 scientific and technological innovations of the year. Based on nanotechnology, the sensors could be made smaller than a grain of sand and will greatly increase safety for future hydrogen-powered vehicles. The invention was patented and licensed, and now is being commercialized. Xiao also has developed ways to create specifically shaped nanoparticles, nanowires and nanoribbons, documenting the magnetic and superconducting properties and potential functions of these incredibly tiny technologies. In future nanodevices, for example, superconducting nanowires could be used as interconnects to circumvent damaging heat produced by energy dissipation. “His efforts have resulted in major contributions to nanoscience—and to greatly enhancing NIU’s reputation,” says Distinguished Research Professor Clyde Kimball. Not surprisingly, Xiao’s research has led to highly cited publications in prestigious journals, including Nature and Physical Review Letters. He has served on editorial boards for three international journals, and the funding his work receives also speaks to his reputation. Xiao has brought in nearly $2 million in support of research projects at NIU from the likes of the U.S. Department of Energy, National Science Foundation and Toyota InfoTechnology Center USA. Additionally, he is one of the principal investigators at Argonne for a fieldwork project funded by the DOE at an annual budget of more than $2 million. In the NIU physics department, Xiao led development of a new introductory nanoscience course, and he has been praised for his work with students, both in the classroom and laboratory. Since 2005, Xiao has mentored eight doctorate, three master’s and four undergraduate students, including two Research Rookies. He has co-advised Ph.D. and master students from other departments, including chemistry and electrical engineering. And his students have gone on to work at prestigious institutions, including Argonne, the Nebraska Center for Materials and Nanoscience, and Bursa Technical University in Turkey. Umeshkumar Patel worked in Xiao’s research group at Argonne and ultimately published several articles with his professor. “Professor Xiao provided me with a unique environment that included outstanding research scientists as colleagues, premier research labs and projects at the forefront of scientific research,” says Patel, who earned his doctoral degree in physics from NIU in 2009. He now works as a research associate at the University of Wisconsin-Madison.